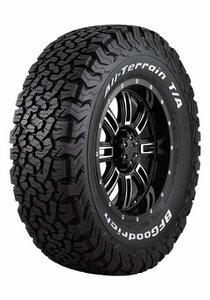 BFGoodrich's toughest All-Terrain tire ever. Split and bruise resistant sidewall rubber, derived from BFGoodrich's race-proven Baja T/A KR2 tire. 20 percent tougher sidewalls featuring race-proven CoreGard Technology to take on the toughest road hazards with confidence. Computer predicted object path design deflects protruding objects from snagging and splitting the sidewall. Specially formulated tread rubber optimally blended to reduce chip and tear for superior gravel road endurance. Serrated shoulder design with staggered shoulder blocks that provide greater maneuverability in soft soil and deep snow conditions. 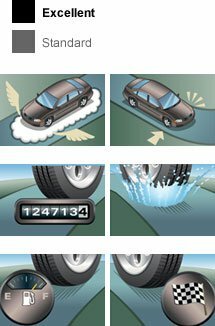 Advanced tire footprint shape results in more evenly distributed stress, for longer more uniform wear. Protruding sidewall rubber blocks that provide increased mud, snow and rock traction, especially in aired-down driving situations. Raised Mud-Buster Bars in the shoulder tread area help to release compacted mud for enhanced traction.